Is It Time to Give up on Caterpillar Stock? Or has the market given you a buying opportunity? There are two different conversations going on right now with regard to Caterpillar (NYSE:CAT). There's the argument over what stage of a cyclical recovery its end markets are in, and then there's the debate over the likelihood and impact of protracted trade disagreements between the US and China. Let's try to shed some light on how investors should view such events in the context of the recent third-quarter results. Highly cyclical companies like Caterpillar are always going to be evaluated with an eye on conditions in their end markets. There's no point getting excited about how cheap a stock is based on its last 12 months of earnings if its profit is going to collapse going forward as a consequence of an upcoming downturn in its end markets. According to the bears, that's exactly the situation with Caterpillar right now. 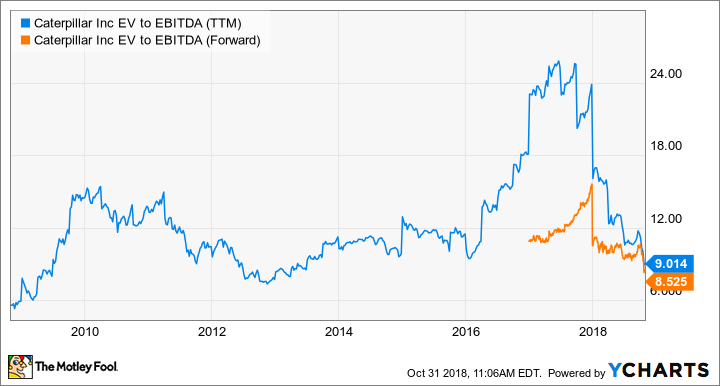 The company may well have just reported its best third-quarter profit per share in its history, with sales up 18% year on year and operating profit up 41%, and as you can see in the chart below the stock's valuation is looking attractive on a superficial level. No matter, the stock's sell-off continued. Its stock is down around 24% year-to-date at the time of writing, as the market bears seemed to conclude that Caterpillar's earnings growth is about to peak naturally and/or future demand from China will falter in response to trade conflicts between the U.S. and China. The naysayers have some logic on their side. While the earnings report was strong, and CEO Jim Umpleby said he feels good about the "state of our business," there were three factors that probably encouraged the bears, and they all relate to future earnings prospects. First, the stock's run in 2017 -- up 70% -- came on the back of a series of startling guidance hikes, but the pattern of increasing guidance came to an abrupt end in the third quarter. When investors get used to management giving more positive outlooks and then the company merely maintains its full-year profit guidance, as Caterpillar did, it's seen as a sign that growth is about to roll over. Second, the fact that management maintained guidance is one thing, but we are already in the fourth quarter and it's reasonable to expect management to reduce the range of its full-year guidance -- even if the midpoint stays the same. Unfortunately, Caterpillar stuck with its full-year guidance for adjusted profit per share of $11-$12. This suggests management is anticipating some possible volatility in the coming months. Third, Umpelby said, "For the remainder of 2018, we expect normal seasonal trends for China." That might have fallen short of satisfying many investors. UBS analyst Stephen Fisher asked how management was feeling good about China in 2019, and Umpleby pointed out that China currently contributes only 5%-10% of the company's sales. He went on to add that "there's a lot of different scenarios, of course, forecasting what's going to happen in China" but claimed he felt good about "China for next year." Given that China is widely believed to be a growth engine for the company -- famed short seller Jim Chanos was short the stock partly due to its exposure to the country -- investors probably wanted more assurance on the outlook for 2019. As noted above, Umpleby sought to downplay the importance of China to Caterpillar's sales, and pointed out that "Many of our end markets are in their early stages of recovery, while others are experiencing robust demand." In other words, he believes Caterpillar's end markets, on the whole, are far from hitting their peak. As you can see below, resource industries is the smallest segment, but it's now contributing more in terms of profit increases than construction industries, and Umpleby stated that "while our global mining customers sales are improving, the recovery is still in the early stages and we expect higher demand for new equipment moving forward." It's a key argument for buying Caterpillar stock. He went to argue, "Currently, we believe favorable commodity prices, strong economic growth and the global need for infrastructure will continue to drive strong end-user demand across many of our end markets." Frankly, unless you own a crystal ball it's very difficult to know how the trade conflict will progress. Moreover, it's hard to know how commodity prices (in this case energy and mining) will pan out in 2019 -- higher would be good news for Caterpillar. But here's the thing: The market appears to be assuming the worst of all worlds, but as things stand right now, and Umpleby points out, Caterpillar is on a good track. All told, given the recent declines, the market seems to be projecting some sort of dramatic slowdown in Caterpillar's growth -- one which might not even happen. This makes the stock look like a good value on a risk/reward basis.